When Star Wars: Episode IV - A New Hope hit theaters in 1977, it not only changed movies forever, but also the merchandising industry. George Lucas built his massive empire on the strength of his films, along with the savvy decision to retain all of the merchandising rights for the franchise, before he sold LucasFilm to Disney in 2012. With Star Wars mania igniting once again, thanks to the release of Star Wars: The Force Awakens, fans will most certainly be on the hunt for not only merchandise, but autographs from their favorite stars as well. 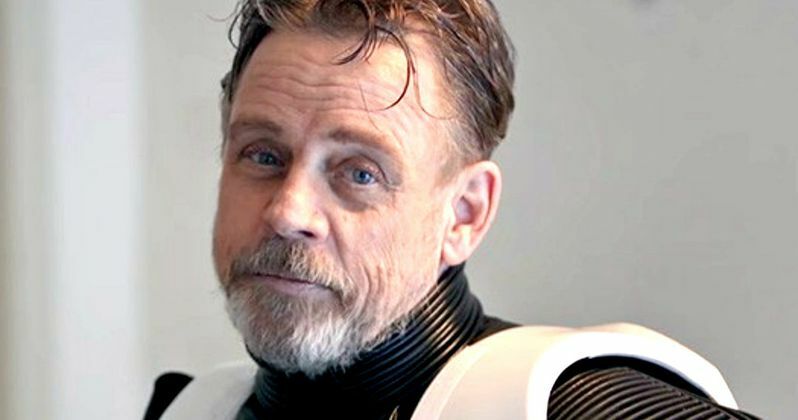 Unfortunately, there are a lot of unscrupulous dealers out there who will fake a star's signature, but Luke Skywalker himself, Mark Hamill, has recently spoke out against these fraudulent practices by verifying his signature for several fans on his Twitter page. Over the past few days, the actor has responded to several fans who asked the star if their signed items were actually real. Unfortunately, some of these items did feature fake signatures, but the silver lining to this is that others can use these examples to help sniff out the phony autographs out there. These autographed cards, photos, posters and other bits of memorabilia also reveal the actor's unique sense of humor. Several of these items feature jokes, most of which are not meant for children, but are quite humorous. Among the actor's humorous captions are "Never show up late for dinner at Dad's house" on a photo featuring Han Solo, Leia Organa, Chewbacca and Lando Calrissian as they encounter Darth Vader on Cloud City. One of the autographs even pokes fun at the "crappy" condition of the card he signed, while others are much more adult in nature, poking fun at a seemingly "excited" C-3PO in one photo. The actor admitted in one tweet that he never thought these joke captions would be made public, while admitting that his sense of humor isn't exactly for everyone. But still, he took it all in stride, while providing a great service for fans by verifying his autograph. Many of his tweets are accompanied by the hashtags #BeatTheDealers, #FightFraud and #FansRule. With the fan frenzy swirling around Star Wars: The Force Awakens getting bigger by the day, it seems, the demand for autographs from the stars will surely grow, which could in turn lead to more fakes being produced to meet the demand. It remains to be seen if any of Mark Hamill's Star Wars: The Force Awakens co-stars will join him in sniffing out these fakes. We have compiled all of Mark Hamill's tweets below which verifies the authenticity of his autographs for his legions of fans, and sheds some light on a few of his off-color jokes as well. If you have a piece signed by Mark Hamill, you send the actor a message on Twitter @HamillHimself and see if he responds. What do you think about the actor taking a stand against phony autographs?